24" Flame Retardant/Fire Resistant Oven Mitt with Extra Long Sleeve, Heat Resistant Cooking Oven Glove is ideal for providing protection for the hands while working with hot pans, pots and other bake ware items. The holder is made of flame retardant material and providing an extra long sleeve and give more protection and help in case you need to reach deeper into ovens. 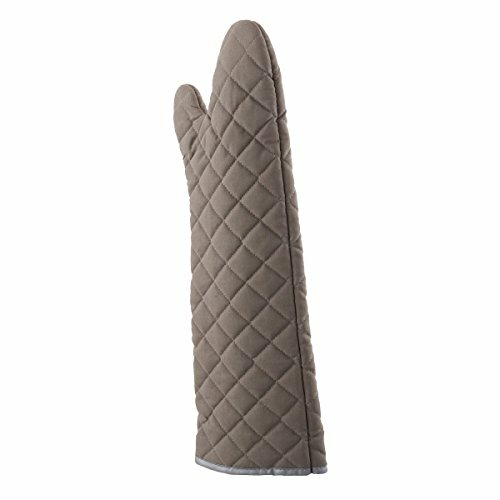 HEAVY DUTY & DURABLE - With very thick quilted padding and soft cloth lining, these oven mitts are definitely flexible unlike many others heavy weight/heavy duty oven mitts that are just too stiff to work with, making easily lift a dish out of the oven and carry it to the table. LARGE SIZE - They have very long sleeves (24-inches) pretty much cover the most part of your forearms/arms up to the elbow, nice roomy cooking mitts, perfect for big/large hands but also not bulky for small hands, you will definitely love the long length. KITCHEN & GRILL VERSATILITY - Home kitchen cooking gloves helps protect hands from hot dishes, pots, microwave oven racks, or off the stove when indoor/outdoor BBQ grilling from high temperature. HIGH QUALITY -Whether removing a pan from your oven, picking up a steaming pot from your stove or tending to a hot grill, you can rest assured that your hands and forearms will be well protected by these high quality, heat-resistant oven mitts. FLEXIBLE AND NONSLIP - Great design! These oven mitts are stable and non-slip grip of all cooking tools.